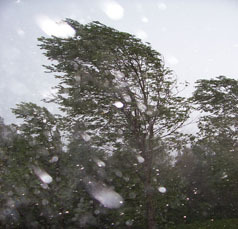 Gales are the most common cause of damage and disruption in the UK. Between 1962 and 1995, 184 deaths alone were caused by building failures resulting from wind. The majority of damage reports come from domestic dwellings. The average cost of damage each year is at least £300 million. Make sure you know what to do! Secure loose objects such as ladders, garden furniture or anything else that could be blown into windows and other glazing and break them. Close and securely fasten doors and windows, particularly those on the windward side of the house, and especially large doors such as those on garages. Park vehicles in a garage, if available; otherwise keep them clear of buildings, trees, walls and fences. Close and secure loft trapdoors with bolts, particularly if roof pitch is less than 30°. If the house is fitted with storm shutters over the windows then ensure that these are closed and fastened. If chimney stacks are tall and in poor condition, move beds away from areas directly below them. Stay indoors as much as possible. If you do go out, try not to walk or shelter close to buildings and trees. Keep away from the sheltered side of boundary walls and fences — if these structures fail, they will collapse on this side. Do not go outside to repair damage while the storm is in progress. If possible, enter and leave your house through doors in the sheltered side, closing them behind you. Open internal doors only as needed, and close them behind you. Take care when driving on exposed routes such as bridges, or high open roads, delay your journey or find alternative routes if possible. Slow down and be aware of side winds, particular care should be taken if you are towing or are a high sided vehicle. Do not drive unless your journey is really necessary. Be careful not to touch any electrical/telephone cables that have been blown down or are still hanging. Do not walk too close to walls, buildings and trees as they could have been weakened. Make sure that any vulnerable neighbours or relatives are safe and help them make arrangements for any repairs. The Isle of Wight's Meteorological Centre, Formaly Wroxall Weather.